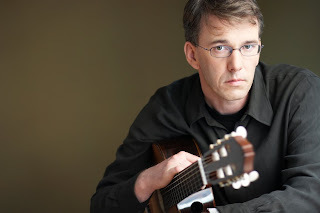 Before we open The Barber of Seville on Saturday night, let's meet our guitar soloist, Michael Partington. 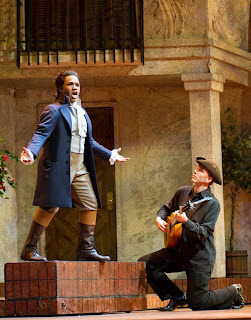 Michael will accompany our Almavivas in the serenades in the first scene (photo by Rozarii Lynch), and will also join us at Seattle Opera next month for the Spanish guitar sound that's part of our upcoming opera, Don Quixote. Welcome to Seattle Opera! You grew up playing guitar from a very early age in Wales; how did you end up living, playing, and teaching in Seattle? I actually starting teaching guitar during my last year in high school in the UK, and I continued to do it full time for about 3 years after graduating. To be honest it felt a little less like a career and more like a great way to avoid having to go to university and then get a job! When I moved to the US I stopped playing guitar for about a year and a half, and then I started taking lessons and practicing again, mostly because I missed it. Meanwhile, I was accepted at the UW to do an English degree (in an apparent effort to "grow up"). My guitar teacher at the time suggested I take the music scholarship auditions, and when they offered me the Brechemin scholarship I decided I should probably do music. While at the UW, I started playing competitions and performing, and I recorded my first CD in my senior year. At this point it seemed like the opportunity to continue not to have to get a job had presented itself once again, so I seized it with both hands. You have a long history with the University of Washington. What’s it like to teach at a school where you were once a student? It's an honor and an exciting opportunity for me in many ways. I've always enjoyed teaching students of any level, but to have the opportunity to help aspiring professionals brings a different kind of satisfaction, as well as keeping me on my toes. While I was a student I felt university gave me a great opportunity to work with other musicians -- guitar is such a solitary endeavor most of the time -- and now it's doing the same but it means working with faculty rather than students, and of course it led to this work with Seattle Opera. Your repertoire, which includes early music, twentieth century music, new music, and Romantic opera classics such as Barber of Seville and Don Quichotte, seems extremely diverse...but maybe that’s typical for a classical guitarist. Who are your heroes, musically speaking? The guitar has a repertoire that reaches back to the early 16th century, via both the lute and the vihuela – a Spanish ancestor of the 6 string guitar that is remarkably similar to the modern instrument. One of our richest eras was the early 19th century, and one of my musical heroes is Mauro Giuliani, an Italian guitarist composer who moved to Vienna in 1810 and was quite the celebrity – so much so that he was invited to play principal cello (his second instrument) at the premiere of Beethoven’s 7th symphony! He was also evidently very good friends with Rossini and wrote many sets of variations that featured themes from Rossini’s operas. Tell us a little about the instrument you’ll be playing in The Barber of Seville. It’s what’s generally known as a Romantic Guitar – an instrument dating from the early part of the nineteenth century -- which differs in some technical ways from the modern classical guitar, but is basically just smaller. If you think of the differences between fortepiano and a modern concert piano you’re on the right track. Mine is a French instrument, probably from the 1840s, with gorgeous flamed maple back and sides and a pearl-and-paste rosette. That’s the decoration around the soundhole – guitars traditionally have a wood-tile mosaic rosette but Romantic guitars often have these very decorative patterns of mother of pearl inlaid into ebony paste. 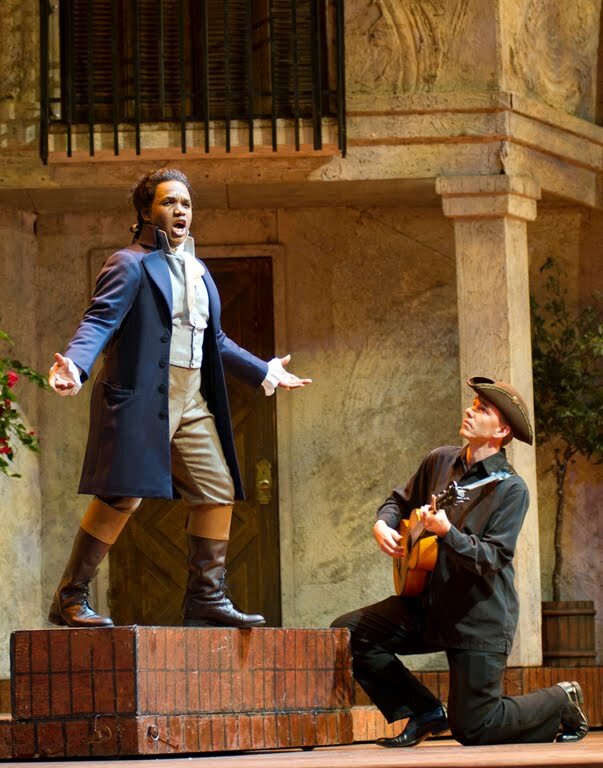 You accompany Almaviva’s serenade beneath Rosina’s window in The Barber of Seville Act 1 Scene 1. Since it’s just you and the tenor, you get to improvise a little in that scene. How would you characterize the difference between what our two tenors, Lawrence Brownlee and Nicholas Phan? There's an imperative to improvise; the intention is for the serenade to really feel improvised, and I end up having a bit of a duel with Almaviva, but he makes it pretty clear who's boss! Lawrence and Nicholas are both tremendous musicians, and playing with them is a real treat for me. Trying to compare them is like comparing The Macallan to a 12 year old Highland Park - both outstanding in their own way. Most importantly, when you're enjoying one you don't find yourself thinking about the other! You’re playing Rossini for us now, but next month you’ll be playing Massenet when we do Don Quichotte (albeit Massenet imitating “Spanish” music). Are there any obvious differences between Italian and French music for classical guitar? That question brings to mind the story about Bizet: when asked if he was planning to go to Spain to do research before writing Carmen, he replied with an emphatic no, as it would only confuse him. At the risk of making what is clearly a vast generalisation I'd say Italian guitar repertoire is more brilliant, overtly virtuosic and passionate. French music is perhaps no less passionate, but it's a far more reserved and reflective intensity.